This modern space rock band have released their second disc for Record Heaven/Transubstans. A double disc collection, this is possibly even better than its predecessor. While you will still find healthy helping of Hawkwind in the mix (how can you play space rock and not be compared to Hawkwind? ), I'd say that this one has more variety than the last. While I'm not crazy about each and every piece here, the ones that grabbed me really blew me away. This comes highly recommended to fans of Hawkwind, space rock in general, psyehedelia and jam band music. 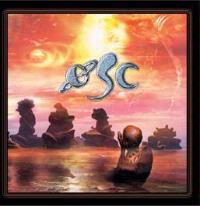 It's a great disc and the really wild thing is that it, like all OSC music, is completely improvised. For more information check out the Record Heaven website. Starting with a quick, “we're rolling,” we are. A chiming sounding guitar texture leads this one off and whooshing sounds bring in Hawkwind-like textures. The rhythmic bass line brings in more echoes of the Hawkmeisters. A retro sounding organ and space sounds are laid over the top of this backdrop. At about two minutes in a new funky guitar sound ups the ante, while the main themes remain the same. This turns crunchy as it carries on. Synthesizer plays over the top of the motif before more retro organ rejoins the fray. A killer echoey guitar brings in elements of '60's psychedelia. Like the best space rock, this travels through incremental changes and additions. A Hendrix musical quote emerges at one point. After all the instruments have had a chance to shine, they drop it back for a while (at about the eight minute mark) and the bass takes a (accompanied) solo. Some Doors-like keyboards come over the top of this arrangement at points. This is simply a screaming piece of space rock that, while evoking echoes of Hawkwind, still has its own identity, too. It's an awesome way to lead off the proceedings. At almost twelve and a half minutes it's still not the longest piece on this half of the set. Feeling like an electronic take on some spaghetti western theme, this is definitely a change of pace. It moves into more standard space rock territory later, but I have to say, this isn't one of my favorites. The guitar solo late is a nice touch, though. This almost feels like what California Guitar Trio might sound like if they added in other instruments and became a space rock band. This, as is typical with most space rock, doesn't go anywhere fast, but the arrangement swirls in slowly growing modes and is a good (but not great) one. Here we get something that feels like a electro-jazz version of Hawkind sound. I guess you could almost see it as Kraftwerk meets Hawkwind in jazzy motif. This is one of the cooler soundscapes on the disc. It turns rather funky later. It gets some killer keyboard sounds at times, too. At about fifteen and a half minutes in length, this is the longest piece of music on CD 1. A psychedelic jam band sound starts it and waves of space are laid over the top. It turns to heavier, Hawk-like modes later with Doors-oriented keyboards skipping over the surface. Still further down the road killer keys and theremin work waves of sound over some scorching space guitar textures. It turns to more pure Hawkwind type sounds in a hard rocking jam later. This one moves in a variety of different directions and is my favorite track on this disc of the set, if not the whole album. A bouncy texture with waves of echoey sound makes up the mode here. This has a definite surf music texture and keys sounding like a barking dog emerge in the mix, too. This one rocks out harder than some of the other stuff as it grows and is another highlight. Awesome space keys lead this off. Then guitars join into the musical fray. Other keys wash over as it's building up. The track pounds out into a fast paced, hard rocking jam just before the one minute mark and we're off on a wonderful journey from there. More retro keys play over the top as space washes provide the backing. Lines of noisy guitar scream across in a tasty manner later. As one might guess from the title a lot of this feels like science fiction music, perhaps a bit like the soundtrack to “Space 1999.” Heavy organ sounds grind across the sound at times as does funky guitar. This is a pure screamer and another highlight of the disc. At almost twenty five minutes, this is the longest track on the set. It starts very sedately and guitar begins to build upwards. Keyboards and whooshing textures enter to play over this backdrop. This doesn't go far in this vein, though, instead dropping back to space for a time. The group play around in this textural format for a short time, then new keyboard textures begin to rise up. They work through a few varying modes and moods within this general motif. At around six and a half minutes in it begins to become more of a “song” structure, with guitar taking the lead in creating the melody. Still, this is never fully realized as they move back out into ambient zones after a time. At around the twelve minute mark, though, they power it out into a new song structure. This is a prog jam with a lot of elements of space and psychedelia. Working through various incarnations and manifestations this gets quite powerful at times. Doors-type keys emerge later and this segment is the longest movement of the track, taking it eventually to its conclusion. Guitar sounds start this one off and they build up with a psychedelic space rock texture. This eventually settles into a satisfying groove as it carries on. As it gradually builds and morphs, it becomes a smoking space rocker that is one of the highlights of the set. The echoes of Hawkwind do emerge on this track, too, but it's definitely not limited to that territory. This song and the next probably have the most clever titles of the whole disc – say it fast and you'll get it. Again, sedate modes begin this. As the song structure rises up it's echoey and covered with plenty of whooshing, Hawk-like keyboard sounds. It modulates through a number of changes on this theme before moving out into a more freeform jazz jam that still rooted deeply in space tones. This reminds me a bit of some of the Grateful Dead's space jams, but with Hawkwind styled keys laid over the top of the format. As it moves onward keys begin to take on textures more like The Doors and Pink Floyd and then the whole arrangement starts to resemble very early Floyd. More Kraftwerk-like sounds come over at times and this whole sound evolves vary slowly. It does turn into something a bit more funky and fast paced later. Then it transforms into a hard-edged jam that calls to mind very early Hawkwind. This is blistering in it's fast paced sonic architecture. A great fusion sort of sound takes over later with lots of funk overtones. At over twenty minutes this is the second longest piece here, but nothing on this second disc clocks in at less than fifteen minutes. A bouncy guitar texture leads this off, but weird keys play over the top of this bluesy, folky mode that still reminds me of early Hawkwind. As this grows it becomes playful and perhaps a bit like early King Crimson. There are spoken vocals, laid over the top, echoes and manipulated in layers of whispers and dream-like textures. This gives way after a while to a weirder soundscape for a time – with odd keyboard textures taking command. Then the keys modulate out into a new melody that is bouncy and a bit New-Age like. Still other elements are present keeping this from being “easy listening.” This moves through a number of odd changes with weird sounds emerging and moving forward, making this the strangest piece of music on the set. It does include some killer echoey retro guitar, though, bringing it into the realm of psychedelia. This never really seems to coalesce all that well, though. For this reviewer it's probably the weakest cut on show here. I just didn't think it was all that easy to listen to and not the best choice to close the disc.